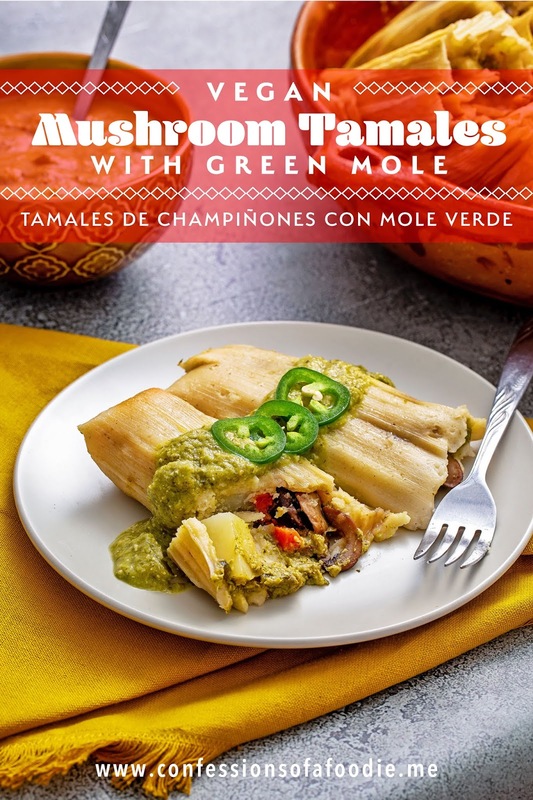 Tamales are the ultimate comfort food and just because you might be following a vegan lifestyle, shouldn't keep you from enjoying them. 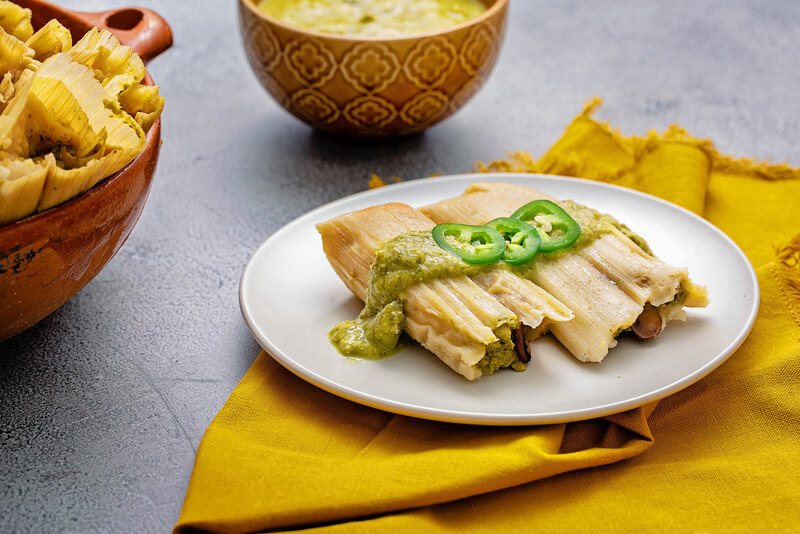 These vegan tamales are filled with roasted mushrooms, and balanced with meaty potatoes and sweet carrots topped off by a spicy green mole sauce. I don't understand why some foods are only associated with particular holidays. Turkey for Thanksgiving and for some people, also for Christmas. Lots of folks do ham for Easter. 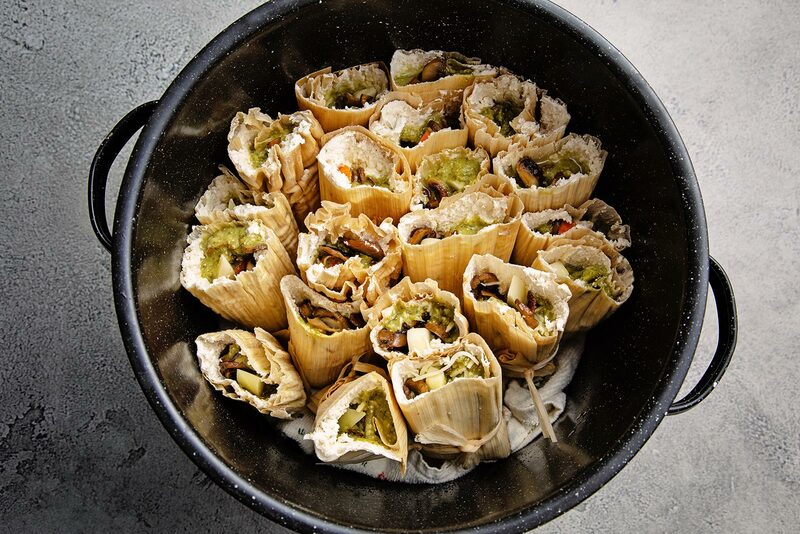 For many Mexican families, getting together for tamaladas (tamale-making parties) are a yearly Christmas tradition. But turkey is a great, heathy meat perfect for any time of year. And who doesn't love a good ham sammy once in a while? Our family starts making tamales several days before Christmas for our Christmas day meal. We continue to eat them until they're gone, usually sometime after New Years. And we wait until the following December to make them again. So during the year to satisfy my craving, I wind up going to a Mexican restaurant. The problem is, I am almost always disappointed. I have yet to find a restaurant made tamale that really tastes like homemade. I decided this year, that I'm not going to wait until Christmas to make tamales at home. It really isn't that complicated. Once all the components are ready to go, the process of filling tamales is actually quite meditative and really not that time-consuming. So, when I feel like having tamales, I am just going to make tamales. 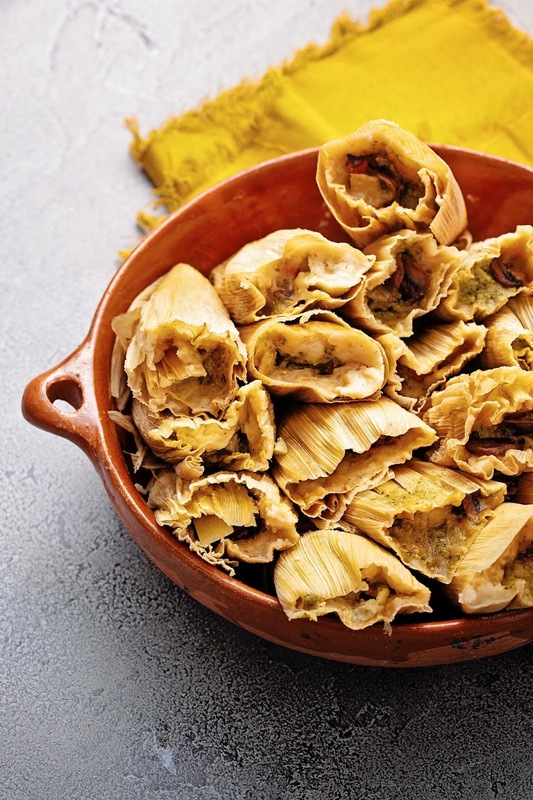 Which means, you might be seeing some tamale recipes pop up throughout the year. I'm starting with these vegan tamales. The vegan soyrizo tamales I shared with you all late last year were a really big hit so I decided to go vegan again this time around. Spend a little time poking around this site and it won't take you long to realize I am no vegan. Nope. I'm most definitely a carnivore. There was a time, though, when I followed a vegan diet. I got to the point, rather painfully, in fact, when I realized that my body functions best with animal proteins. But that's not to say I don't enjoy vegan or vegetarian fare from time to time. It's all about balance, after all. The problem with most vegan food for me is, aside of soyrizo, I'm not a fan of faux meat like tempeh or seitan. 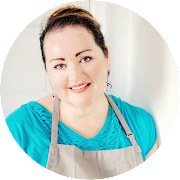 I tried working them into my meal planning those two years I was following a vegan macrobiotic diet. I just never cared for their taste (usually overly salty) or texture. Though I'm sure Japanese vegans have worked out a successful method of steaming them, I have no idea how they'd do steamed inside of masa. My quest was to find a vegan-friendly protein that would hold up to steam cooking. Roasted mushrooms are one of my favorite foods. I can snack on them straight off the baking sheet and be a happy camper. And since mushrooms release so much water when they cook, I knew roasting first would be the perfect solution for these tamales. Even after an hour of steaming, the mushrooms still had that roasted texture and umami flavor that stood up well to the sauce. Speaking of the sauce, I opted for a quick and easy green mole sauce. 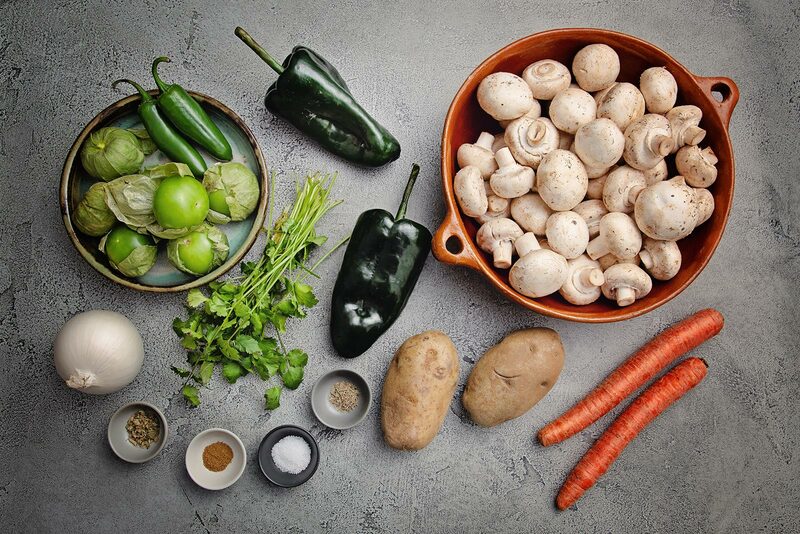 The usual suspects for salsa verde are here: tomatillos, jalapeños, garlic, onion, cilantro. Then there's also poblanos, lettuce leaves, pepitas and for creaminess, avocado. Truly one of my favorite versions. I used fresh unprepared masa from Northgate Market. If you don't have access to fresh masa, check out my easy prep for vegan masa using Maseca brand masa harina for tamales (instant corn masa flour not to be confused with corn meal or regular corn flour). These steps might seem overwhelming when you see them written down, but it isn't that difficult or time consuming. You could also do this in steps, preparing the mole, mushrooms and prepping the veggies the day before assembly, saving the masa and corn husk prep to the day of assembly. Place corn husks into a large soup pot. Add the husks and fill with water to cover by two inches. Bring pot to a boil and then simmer on low while you prepare the ingredients. Preheat oven to 400 degrees Fahrenheit. Remove and discard the stems from the mushrooms. Brush off any excess dirt or wipe with a slightly damp cloth. Thinly slice the mushrooms. Split them between two large rimmed baking sheets. Drizzle a tablespoon over each sheet, toss to coat the mushrooms and spread them out evenly. Roast for 15 minutes. Remove pan, flip the mushrooms, return to oven to roast another 15 minutes. Remove from oven and sprinkle with sea salt to taste; set aside. Place the poblano peppers directly on the flames of a gas stovetop to char skins, turning occasionally to blacken evenly. (Alternately, place peppers on a small baking sheet and put under a broiler, turning the poblanos every couple of minutes until blackened.) Remove peppers to a plastic bag and allow to sweat while you work on the next part of the recipe. Remove the husks from the tomatillos then rinse to remove the sticky residue. Place in a pot of water along with the jalapeños, onion and garlic. Bring to a boil then reduce to a simmer for 5-8 minutes or until the tomatillos have turned an olive green and their skins just start to split. 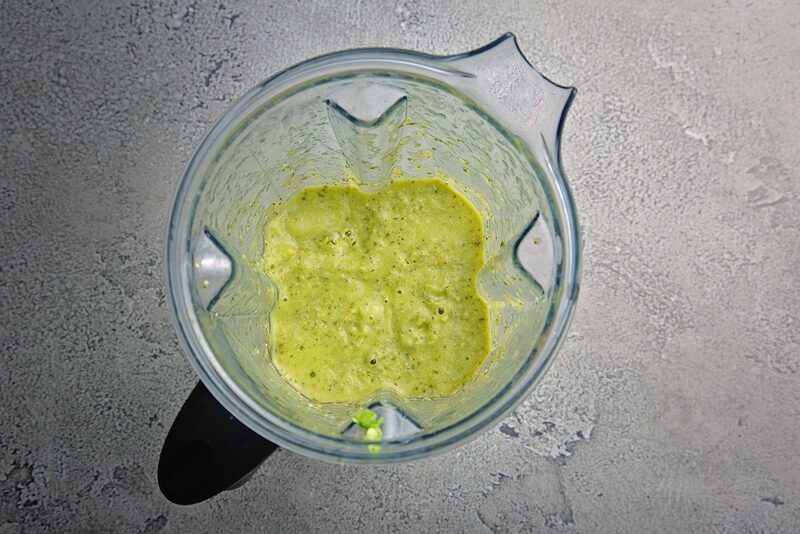 Remove the tomatillos, garlic and onions to a blender. Cut the stems off of the jalapeños. If you don't mind spicy, add the entire pepper to the blender, otherwise, split them open and remove and discard the seeds and veins before dropping them into blender. Add a ladle of the cooking liquid. Blend on high to purée until smooth. Add the cilantro along with the next six ingredients and blend until smooth. Pour mole into a bowl. 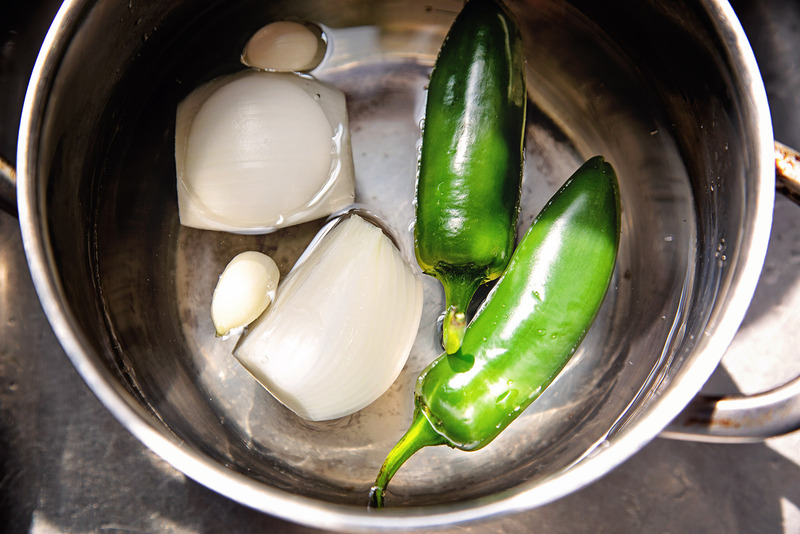 Remove the poblanos from the bag and peel the skin off with your fingers or use a spoon or the edge of a knife to scrape off the skin (don't rinse, though, or you'll rinse off the flavor you built up by charring). Cut the stemmed tops off, then split the peppers, removing and discarding the seeds and veins. Cut the peppers into strips then into ¼-inch dice. Stir into the mole. Set aside. 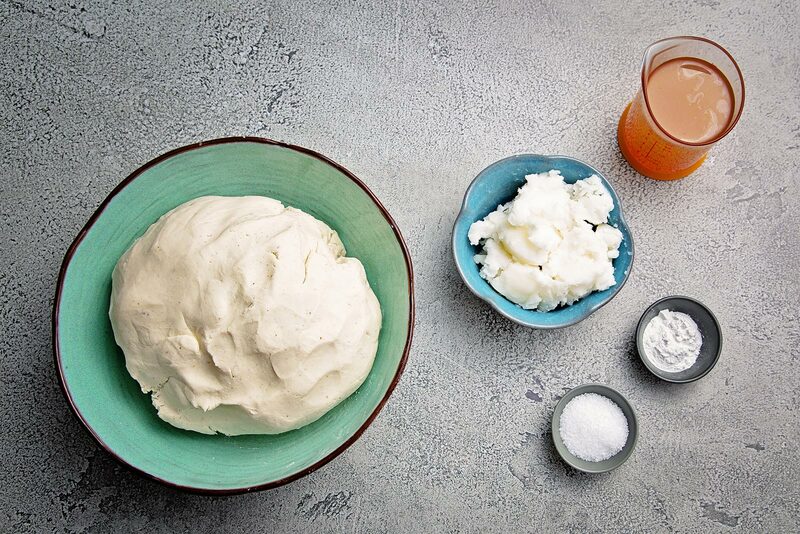 Place coconut oil, baking powder and salt into the bowl of a stand mixer with the paddle attachment. Beat on low for two minutes then on high until the coconut oil is light and airy and has tripled in volume, about 10 minutes, stopping to scrape down sides often. Reduce the speed to medium. Add about a cup of masa and beat until smooth. Continue adding a cup at a time, beating to fully incorporate before adding additional masa. 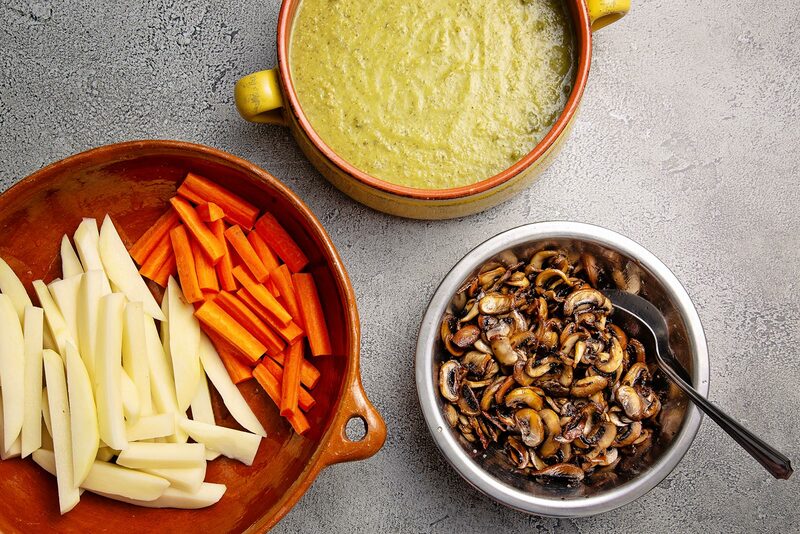 Arrange the prepped mushrooms, mole, masa and vegetables in front of you. Drain the husks. 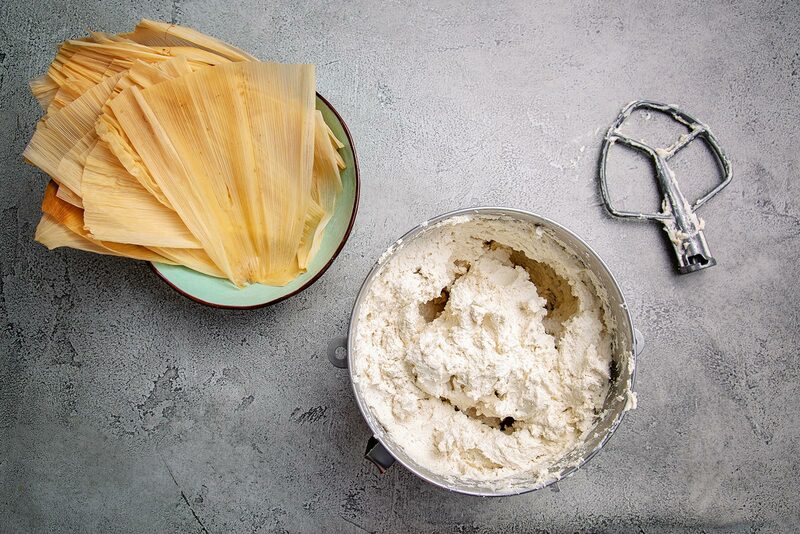 Remove one and determine which side is smooth by running your fingernail against each side; tamales are built on the husk with the smooth side facing up. With the wide side of the husk facing you and the thin side (tail end) facing away from you, smooth about 2- 2 ½ tablespoons of masa onto the wide side of the husk. Leave ¼-inch of the wide edge and the sides exposed and stopping about ⅔ of the way up the husk, leaving the tail end of the husk free from masa. Add 1-2 tablespoons of the mushrooms to the center of the masa. Add a potato strip and a carrot stick then spoon 1-2 tablespoons of the mole over the filling. Bring the sides of the husk up so they meet at the middle and tuck one side in and the other over like you would swaddle a baby. Pull the “tail” end up towards you, folding it snugly against the tamale so you create a little packet with the top end open and the bottom securely folded up over the seam. Place on a plate or sheet pan, seam side down. Repeat this process until all the masa is gone. Save the leftover mole to use as a garnish when you serve. Steam the tamales: Add about 2 cups of water to a 5-quart pot. Insert the steamer (if your pot doesn’t have one, you can use a vegetable steamer basket that opens up or poke holes in an aluminum pie pan and insert that upside down into the bottom of the pot. Use less water though; water should not touch the bottom of the tamale during the steaming process). Line the steamer with 2 or 3 of the leftover corn husks then add the tamales, standing, open side up. Cover the tamales with more husks or a damp tea towel, then top with a tight-fitting lid (if your lid isn’t secure, first seal the pot with aluminum foil, then top with the lid). Bring pot to a boil, then lower heat to medium-low and steam for 1 ½ hours. Check for doneness: After about an hour and 15 minutes, carefully uncover the pot, remove one tamal with a pair of tongs to a plate, carefully unwrap one side of the tamal, if the husk pulls away cleanly and easily, the tamales are done. If the masa sticks to the husk, re-wrap and return to the pot. Continue steaming for 10 minutes or until the husk pulls away cleanly. 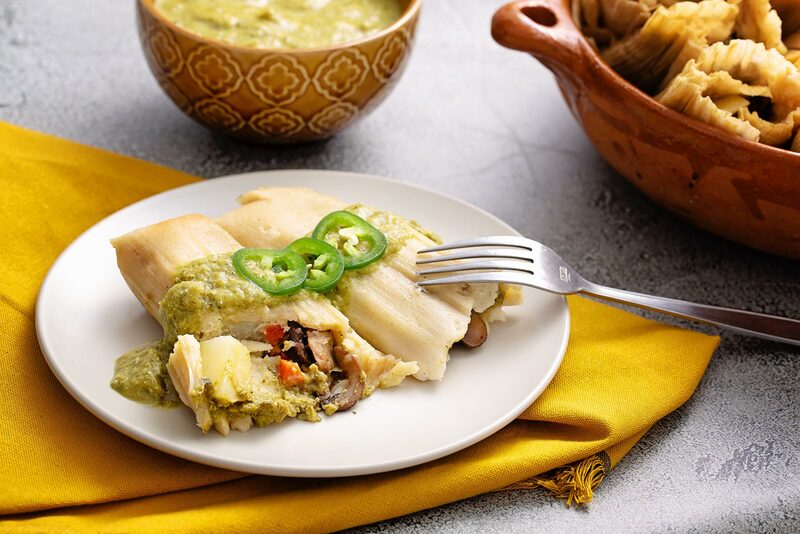 Serve tamales with the extra adobo, a side of Mexican red rice, retried beans or a crisp green salad. To store and reheat: Let tamales cool completely before placing into re-sealable plastic bags and store in refrigerator. To reheat, steam for 10 to 15 minutes. You can also microwave: Wrap one or two tamales in a clean, damp tea towel (husk still on) and microwave on high for 3-5 minutes. Let sit in the microwave for a minute before removing.